There is nothing better then Christmas in July! It’s time for our annual “Giftaway”! That means if you spend $599 or more, you get a free gift card from America’s favorite retailers (Best Buy, Lowes, Toys R US, Target, Wal-Mart, Home Depot and more!) and you also have no interest until 2018! We have the perfect mattresses to give your back the rest it deserves and the perfect couches and sectionals to brighten any room! The more you spend, the higher your gift card amount will be. Now is the best time to give yourself or someone else a special gift of relaxation and comfort! 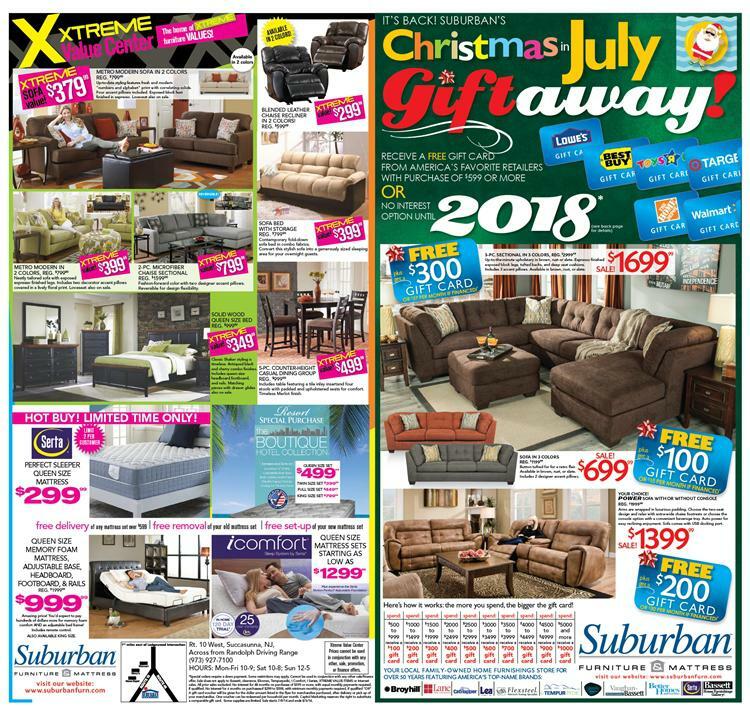 Posted on July 29, 2014, in Sales and Promotions and tagged christmas in july, furniture sales nj, holiday free giftaway suburban furniture, new jersey furniture stores, suburban furniture, suburban furniture nj. Bookmark the permalink. Leave a comment.